.. All they grab is the important stuff: rod, reel, flies, camp food. utensils, Pocket knife, kit bag, sleeping bag, poncho, TP, other shoes, spare undies, other jacket, hats, polarized specs, beverages, knowledge, determination, buddy, bankroll, road food. .. Perhaps the most important bit is the "Universal Field Box." It's an assemblage of flies that, from experience, can handle most situations in Yellowstone National Park. .. This is the time of year when a day can make the difference between catching and crying. The neighbors head to those places where the hatches bloom and then rapidly disappear. 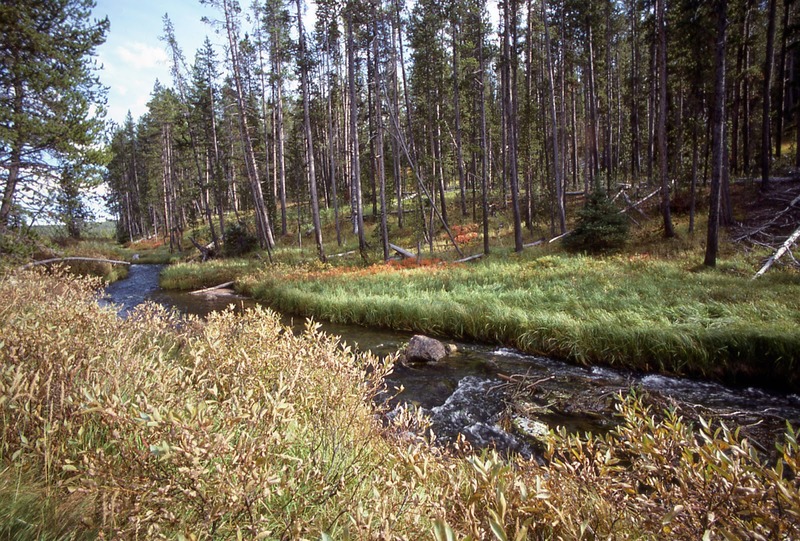 They search out the little streams in Yellowstone National Park where Summer is shorter than elsewhere. They need to hike and walk and run. .. These places are not in the guide books. They are not secret places they are just not popular. These are places beyond where the road ends and the trail begins. .. Our neighborhood fishers are funny folk. Their networks for information reach into other neighborhoods across the region. They seldom hit the feather merchants for conventional wisdom. They form a loose fraternity of fishers rather than talkers. They are cooks and servers and housekeepers and mechanics and clerks and other normal folks. They meet in pubs in the wee small hours after work. They listen to the woods and the waters. The local jungle drums from near and far relate intelligence that is seldom over eight hours old. Off they go - gainful employment be damned. .. Their food is sparse and basic. Their accommodations are rocks and dust and dirt and ants and beetles, and sage and quiet. Morning comes early and night comes late. Fishing days are crammed full of exploration, observation, speculation, and meditation. More often than not each day is full of anything but the fish. The fish and the fishing become excuses for exploring a neighborhood park that is larger than most. .. The assemblage of local fishers has little in common with new cars and destination fishing. This is an assemblage of folks that have time for only work, family, friends, fish and food. They are here because of the place. They could do what they do anywhere. They love the park. They love the town and live in it. They fish: they catch. They work hard and play hard. Bless their hearts, they share some hard won insights with us. They don't write books. They seldom take hero photos. They think a blog is something akin to an ink blot. They smirk at us and go about their lives. .. Right now they are catching in a variety of places around the neighborhood. Gulpers in Hebgen Lake. Cutties on Cache Creek. .. A mixed bag above the closure in the canyon on the Firehole River. Brookies on the Gibbon River in the little meadows at the end of the road by Virginia Cascade. Beaver pond fish down the trail on Duck Creek. 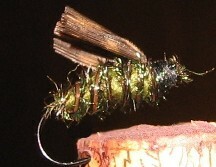 Evening caddis hatches on the Gallatin River. Straight Creek baby fish. and of course those big Rainbow Trout that hide in the cold water of the deep cut banks at Baker's Hole. .. We can't fish all those places. We envy the youth and exuberance of the neighbor kids. We appreciate the information that they share with us. We share it here in the hope that more than just famous waters gain new friends among the visitors to our neighborhood. Waters without friends become lost and subject to depredation by the non fisher. .. Tonight we're headed to a small tributary of the drowned Madison River. It's only about 100 yards long. It dumps into the monstrous Hebgen Reservoir. It could have been nearly a mile long. 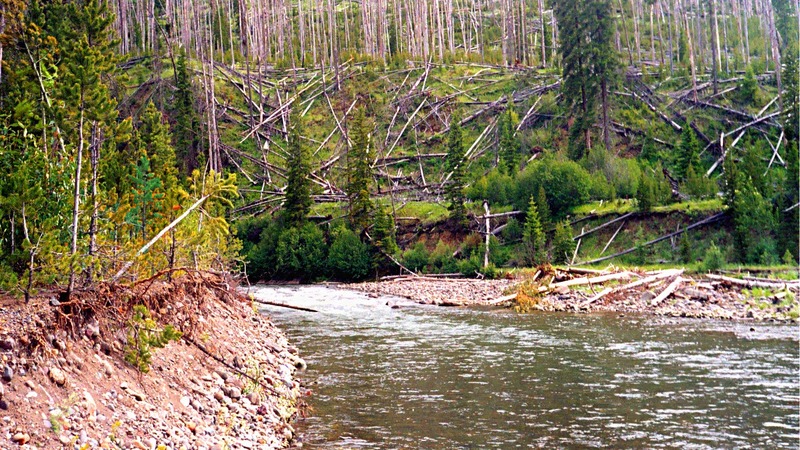 It will be there again after the inevitable removal of Hebgen Dam: long in the future. It's cold and spring fed. It holds enormous fish and small fish. They eat well and only get molested by their friends and the friends of the creek It will soon be developed and canalized. It has had few friends; that's why it has no name. .. Off to our favorite culvert. .. 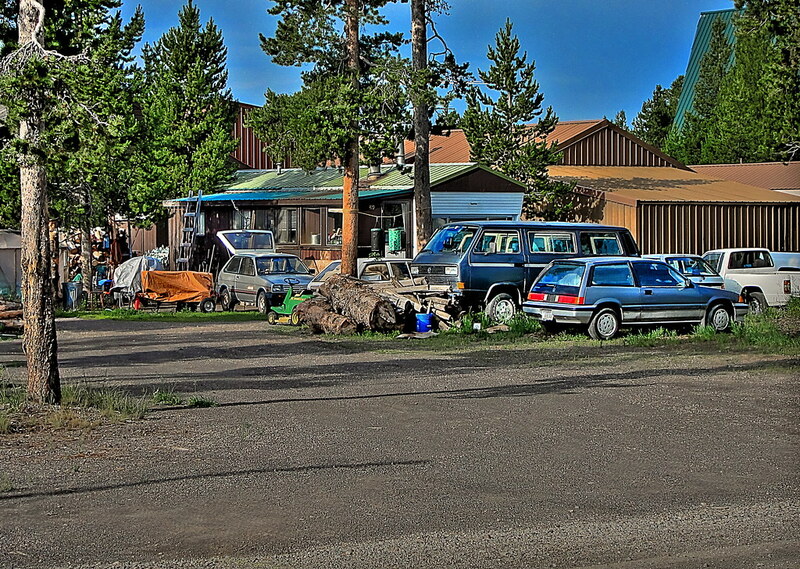 While the Hoppers have inundated the campground at Slough Creek, and while the elbows are thronging to the famous northeast trinity of Slough, Soda, and Lamar, free-spirited elbows are working up a sweat and enjoying three little lakes with grand views and glorious fishing. Pretty good catching too. ..If you can handle a steep trail under a blistering sun we suggest that this is a proper destination for the angler not obsessed with headhunting or running water. Take your camera and a lunch. Take your bear spray and someone else who will enjoy postcard beauty and a few fish along the way. .. The trail is a 1/2 mile of uphill grunting. Once up the hill from the road you will encounter an undulating landscape that holds the true trinity of the northeast fishery: Trout Lake, Buck Lake, and Shrimp Lake. These little gems are tucked into periglacial depressions and are well worth the hike. Plan to spend a day or two exploring. 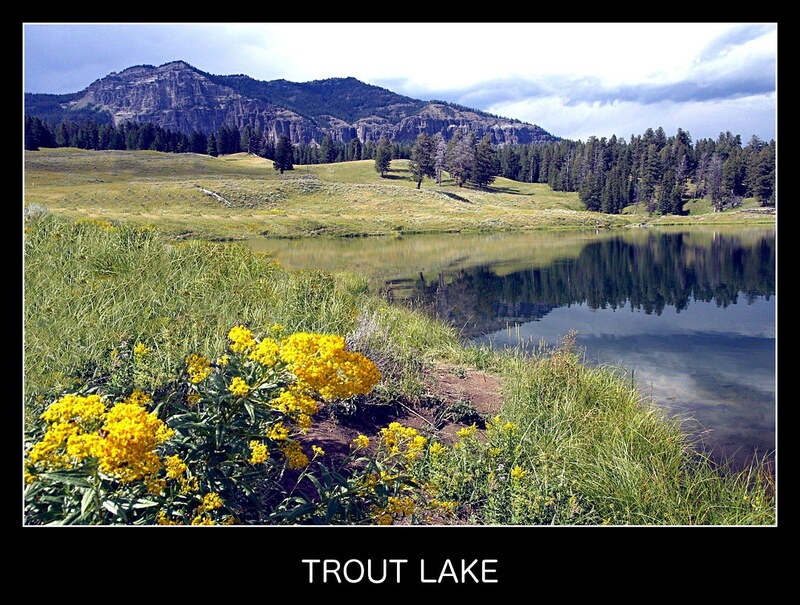 .. Buck Lake is also worth fishing for the catching. Shrimp Lake is supposedly devoid of fish but there are otters there too - go figure ? ? ? ? .. For some reason known only to the trout the catching has been a bit harder than in recent memory. The fish are still large, (medium and small too.) The fishers are still happy to have been there. The otters are still fat and photogenic. The hoppers are hopping. 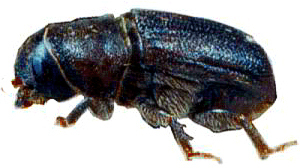 The beetles are beetling and the trout are eating. .. If you plan to lug a float tube up the hill be sure to get a boat permit for the tube. It's a park requirement and the rangers know. .. For those of us trapped on the west side of the park the mysteries of the northeast corner hold a fascination that can only be assuaged by the expenditure of time and gasoline. A few of us trek to Cooke City and stay with friends for a long fishing weekend. Some of us camp in the wild. 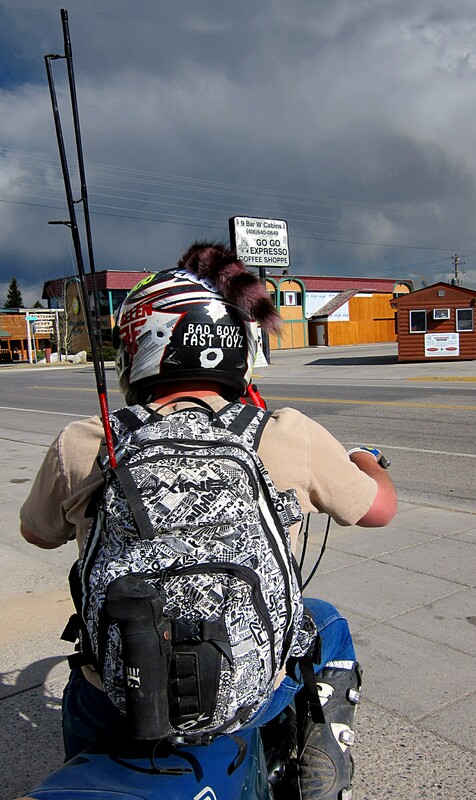 The affluent grab a motel and hang out: fishing hard each day. A trip up the hill is always on the schedule. .. Closer to home, it's important to note that the Gallatin River is providing some excellent evening activity for both fish and fishers. Hoppers, ants, beetles and caddis are all active and providing entertainment for a the neighbors. .. It's a busy time of the year for the merchants in town. High summer shopping is in full swing. The streets are crowded and the grocery stores become genuine freak shows with a cacophony of children's shrieks, carts clattering, languages sputtering, and clerks smiling through it all. It's worth viewing if you don't need the groceries. .. We're avoiding it all and fishing a small little no name tributary of the Notellum River. We will spend the upcoming weekend enjoying the mass gathering of cartoon cars at the 44th annual West Yellowstone Rod Run. .. 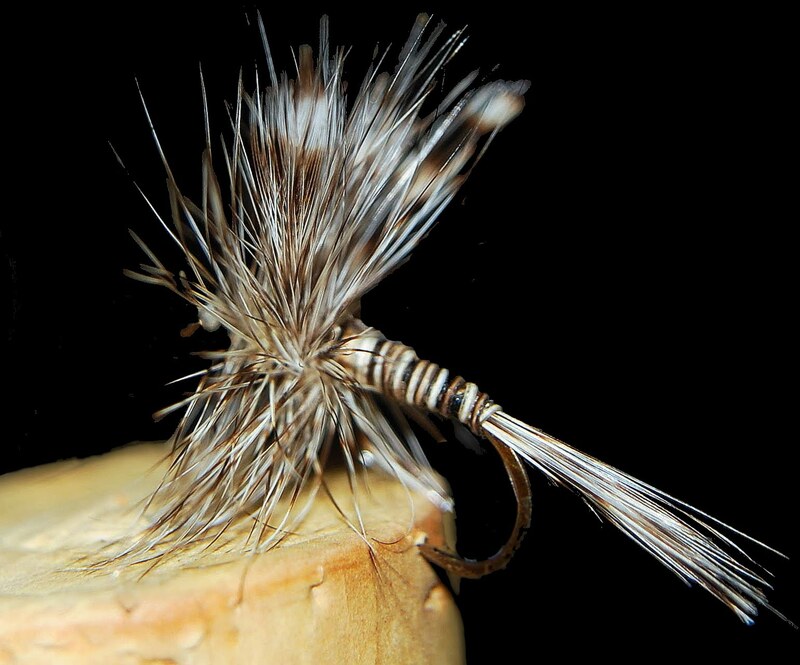 Briefly: there is no better dry fly water in all of Yellowstone National Park. It's name is not in the lexicon of "experts" whose stories start with "I fished . . . ."
.. We don't recommend it to many folks. We don't mention it too often. We're not afraid it'll be "discovered" and become too crowded - it's too far from the road. In fact just forget that we mentioned it at all. .. Adam "Horn" Miller was born in Bavaria in Oct. of 1839 and moved to St. Louis when he was a child. He came up the Missouri River in 1854 from St. Louis and settled in Emigrant Gulch as early as 1864 or 1869. .. He prospected in Yellowstone at that time along with John Davis. He later prospected with Bart Henderson, Ed Hibbard, James Gourley, Sam Shively, Pike Moore, and Joe Brown. He discovered gold in the Cooke City area with Bart Henderson and others in 1869-70, naming their mine the Shoo Fly Mine. .. During the next few years he helped Bart Henderson build the road from Bottler’s Ranch to Mammoth. He acted as guide for Superintendent Norris in 1877 in the northeastern portion of the park when Norris was looking for another northern approach to the park. He again guided Norris and photographer Henry Bird Calfee in 1880 on an exploration of the Hoodoo Basin. .. Miller was one of the scouts under Gen. Howard during the Nez Perce War of 1877. Miller also did guiding and hunting out of Cooke City. When asked if he ever killed an Indian, he replied, "I never went to see, but I shot a good many." Later on he settled down in a cabin across the Yellowstone River from Yankee Jim. 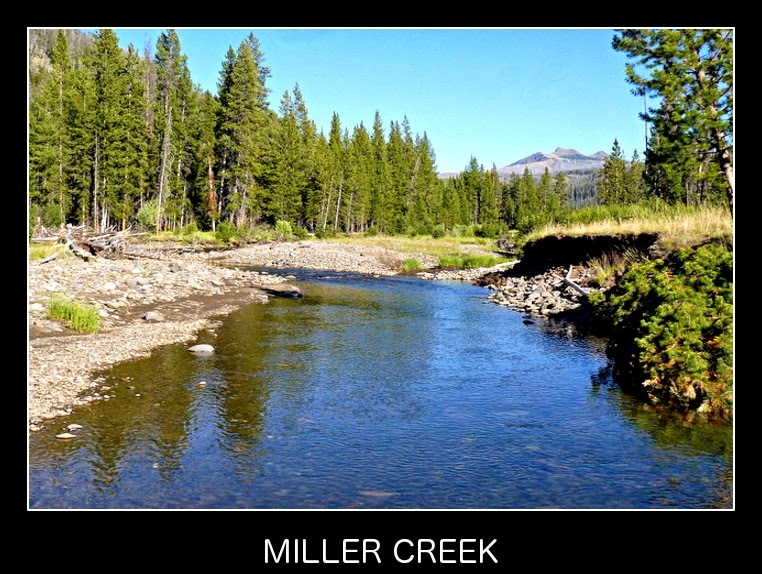 .. Miller Creek and Miller Mountain were named after him. He died in 1913. His obituary described him as a "man of sterling character, a man without enemies of any kind, it is said, and a citizen who always had a kind word for everyone." [[ REFERENCE HERE ]] Thank you Geyser Bob. .. The catastrophic intersection of normal people on vacation and rabid destination fly fishers is taking place in a remote corner of Yellowstone National Park. .. This is a corner of the world where a new kind of fish is rapidly evolving: "THE SLOUGH CREEK RAINTHROAT." .. This not so rare trout is the byproduct of miscegenation by fish that do what fish do - in water that people drink. To the normal folks the fish is just another trout. 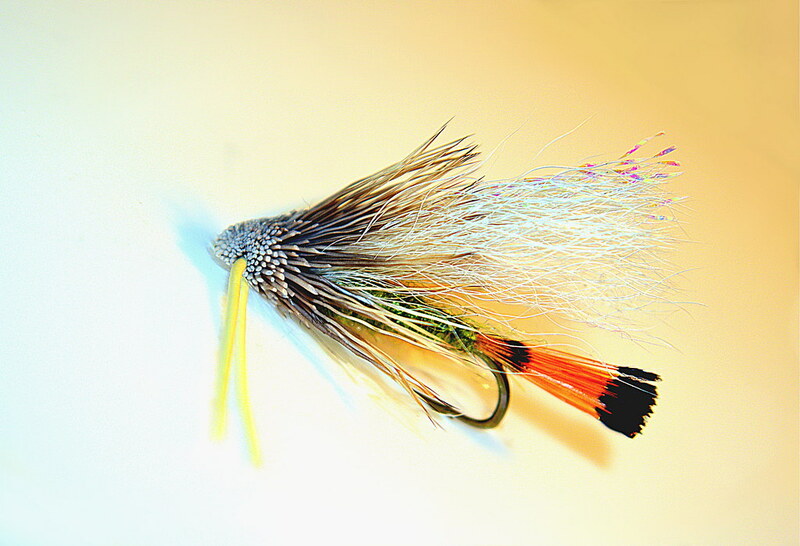 To the fly fishers it is a highly sought after trophy. 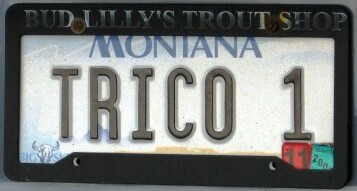 A trophy that is featured in hero photographs of conquering fishers in the wilds of Yellowstone. .. Despite regulations and suggestions, scofflaws lovingly release the trophies back into their home waters to continue their place in the origin of a new sub-species. Fish doing what fish do. The religiosity of the catch and release ethic is unbreakable in some folks. .. 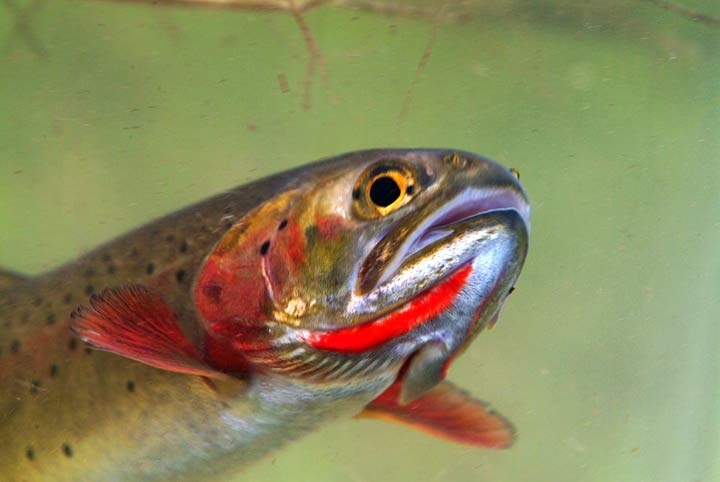 Right now there are bugs aplenty for the Rainthroat trout to eat. Around, and below, the campground at Slough Creek the morning fishing is tantamount to a simplistic endeavor. 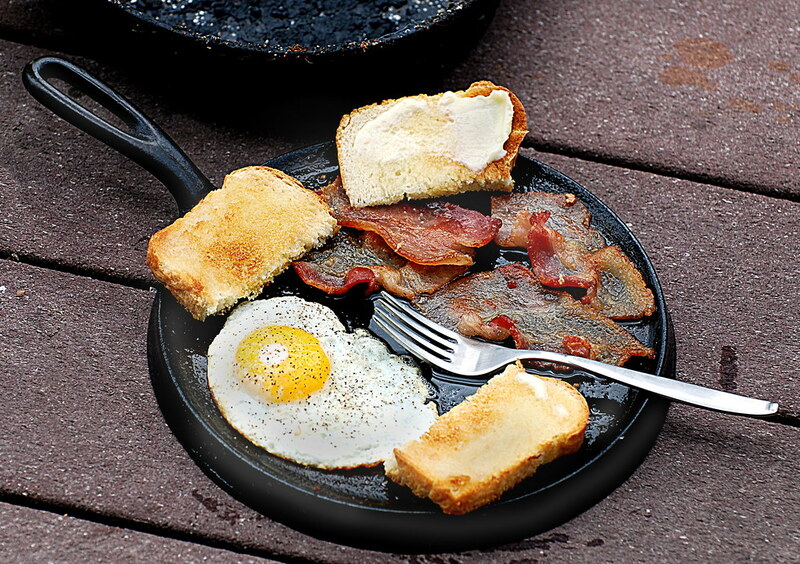 Teeny-Weeny PMD's are the breakfast fare. Drakes for lunch. 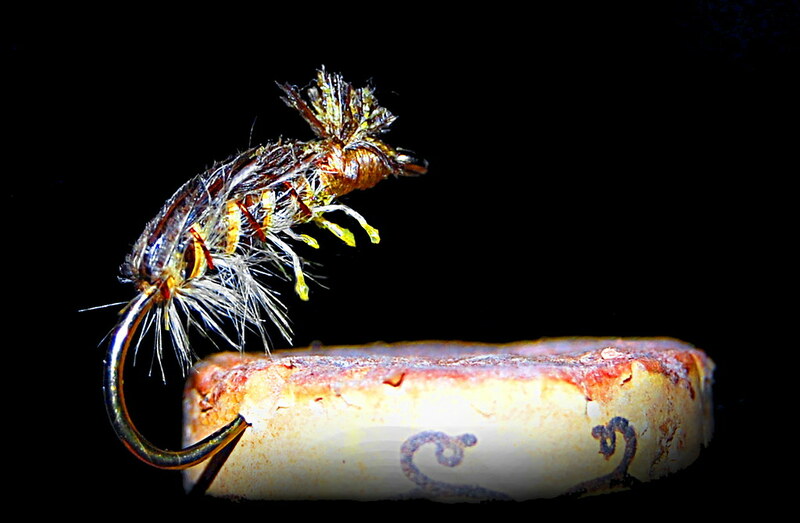 Caddis for dinner. A few various stoneflies thrown in for snacks. This is the place to practice your midstream etiquette and socialize with kindred souls. .. Up the trail and into the big meadows is where the dedicated anglers will be found. 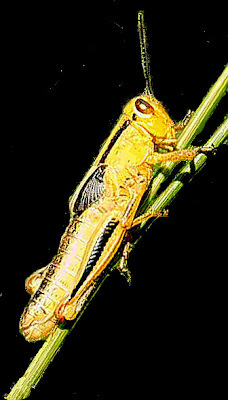 Creeping and crawling is the preferred mode of locomotion in the lush grasses. No arthritic fishers need apply. .. Success comes to the practiced caster. Take your pocket binoculars and pick a target. Figure out what the fish are eating. These Rainthroats are frequently particular about what they eat, some of them are "one-cast-fish." Make it count. .. There are places on Slough Creek where the water is swift, full of boulder gravel, and highly oxygenated. 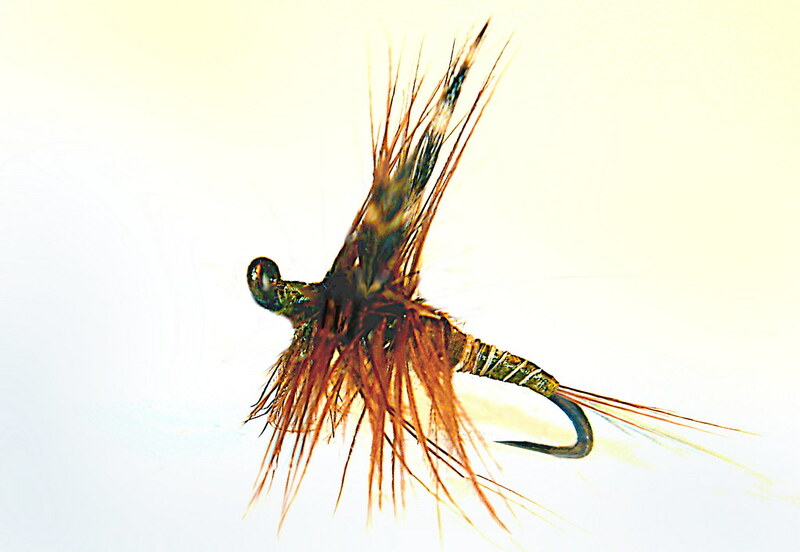 Here and there are small populations of big and little stoneflies. Take some yellow ones. 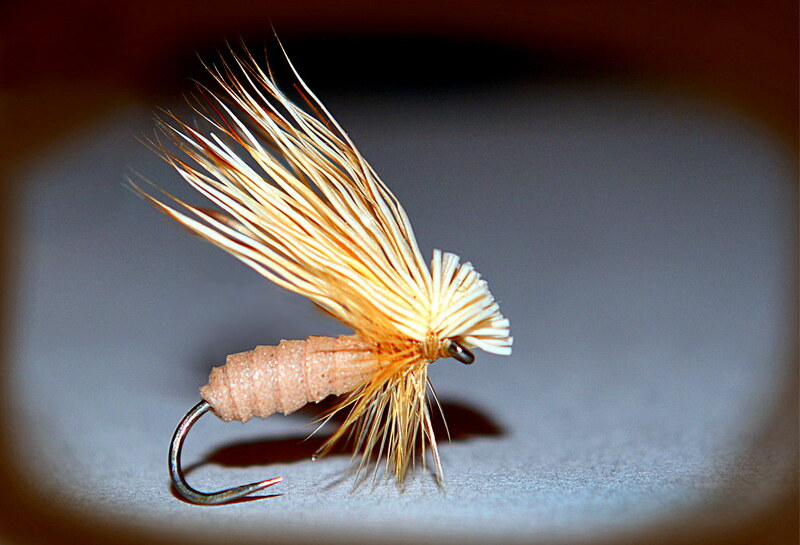 .. Of course there is always the lowly caddis fly. Take several of your favorite imitations. 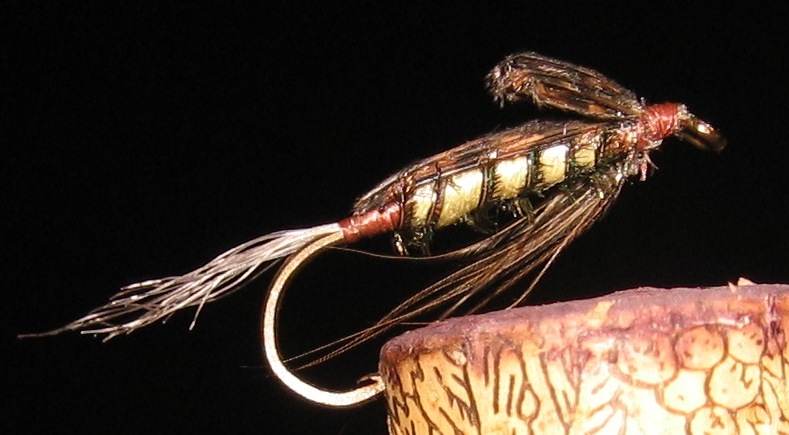 Be prepared to fish with nymphs, emergers, and adults in the late afternoon and evening. .. If you take a large enough selection it will be possible to spend many productive hours sharing the patterns with other fishers of a like mind. Be sure to have your vintage Wheatley Fly Box in a readily accessible pocket of your $300.00 Filson® Foul Weather Vest - after all it may rain. 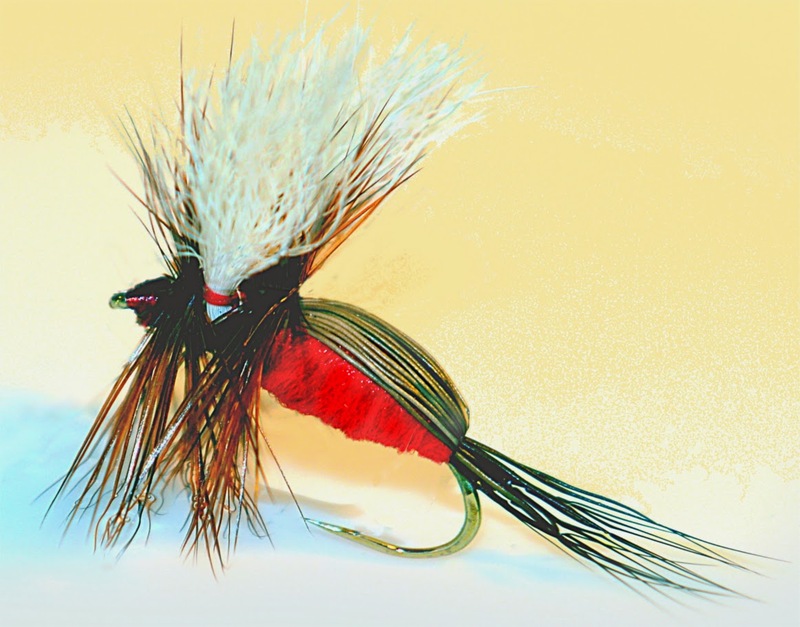 ..The best information about what to fish with and where to go is easily gathered from the feather merchants in the neighborhood. A few phone calls and a visitation on your way out will allow you to be fully prepared for the wild adventure of Rainthroat hunting. 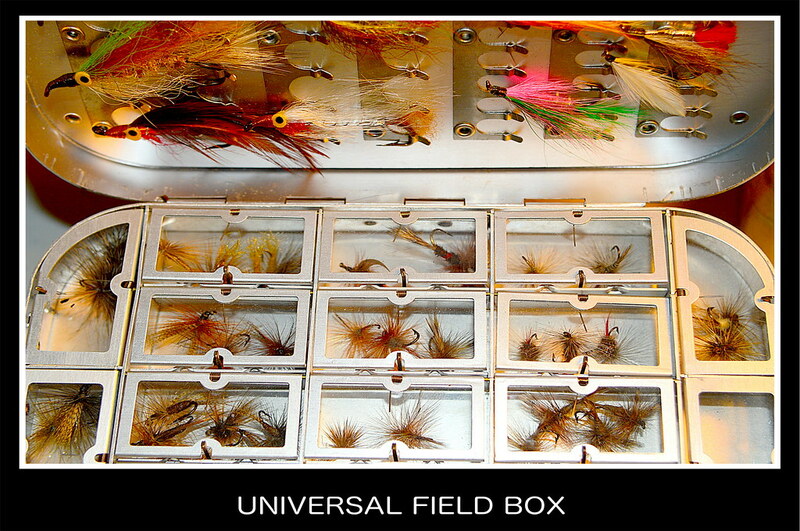 You might even be able to buy a new fly box and several dozen flies to cram into it. .. 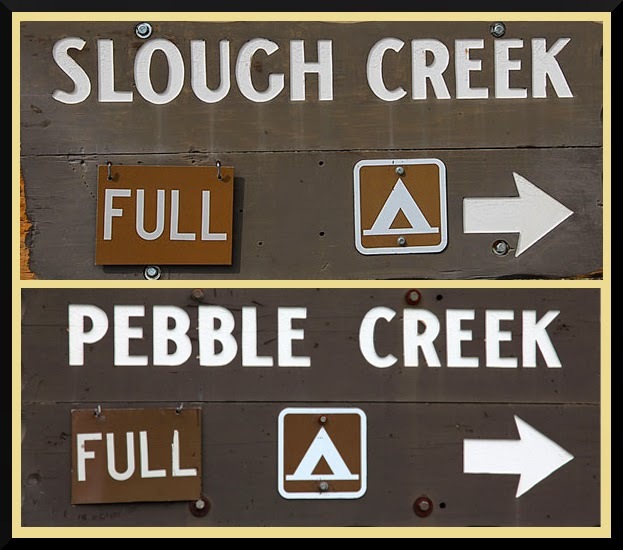 Some folks with less taste for social adventure will walk upstream from the campground at Pebble Creek. 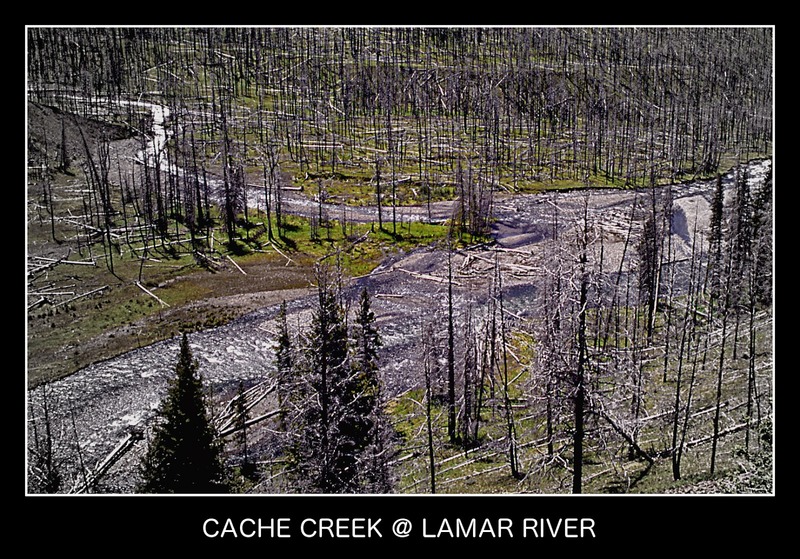 The creek holds thousands of Cutthroat Trout to be visited, (a few rainbow trout and some rainthroat trout too.) 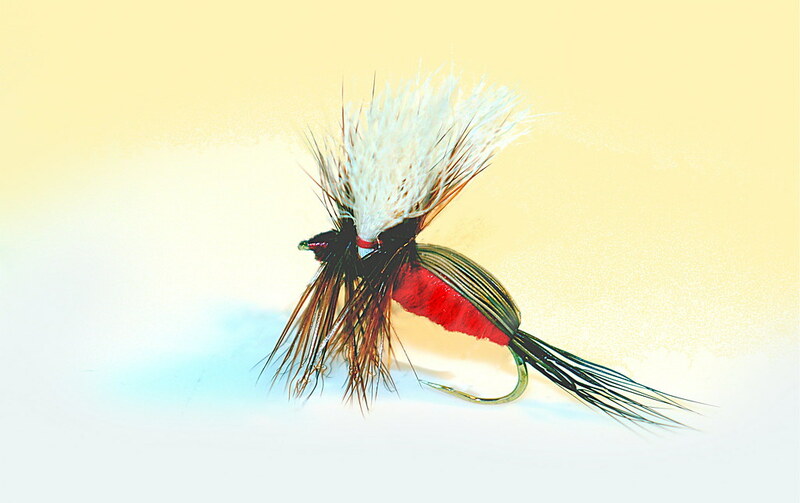 The Cutthroats are the typical brightly colored, very healthy specimens in the 10" to 14" range that are neglected in favor of the fish just down the road. .. The stream is small. The trail is gentle, (for a couple of miles). The scenery is overwhelming. The bugs are prolific. The mosquitoes are ravenous. The bears are frequent. and the elbows less dense than many of the more famous social waters. .. Forget the vest. 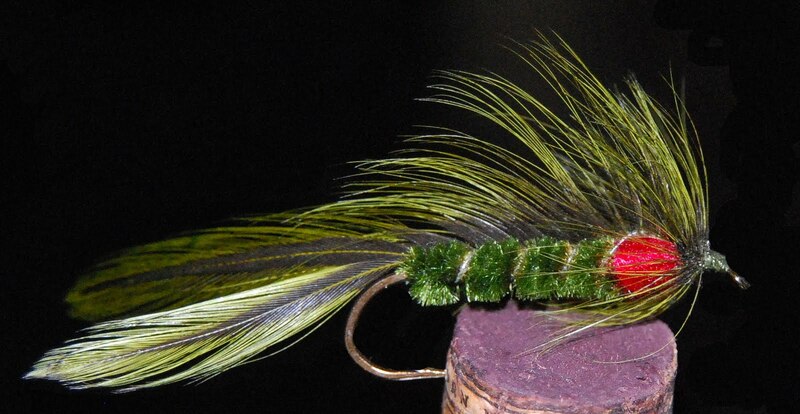 Take a dozen flies and enjoy this fine little stream before it gains the grandiloquent status of a social fishery and the Rainthroat Trout take over. .. Oh to have the legs and exuberance of youth. For us, that time is long gone. Some of the neighbor kids still have it all. .. They travel light and fast. They fish the best water at the best time and in the best way. 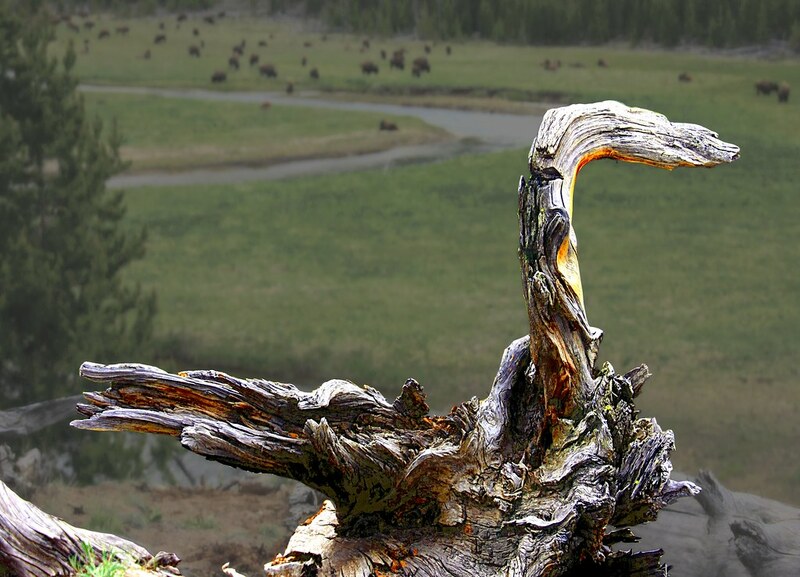 They are on intimate terms with the lakes, rivers and streams in our neighborhood and in Yellowstone National Park. They cram a month's worth of fishing into each week and a year's worth into each month. .. For reasons unknown these kids have befriended us and treat us far more kindly than the cliquish establishment fly fraternity. They probably know more and fish more as well. They don't have to impress visitors. They don't have to sell the latest and greatest. They don't have to engage in hyperbole and fantasy by the day or hour. They are out there and doing it. 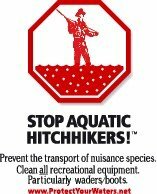 .. One rule that permeates all of their catching endeavors is expedience and effectiveness. Their gear is good and effective. 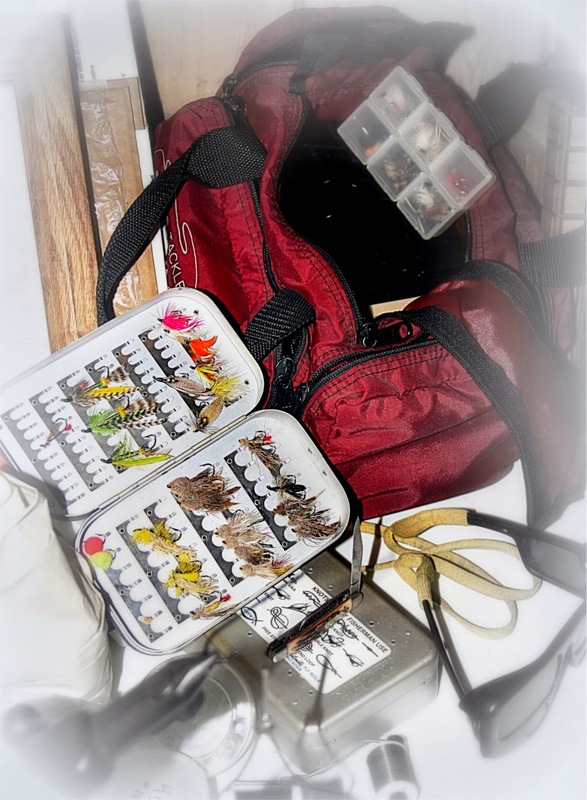 It is not limited to fly fishing stuff. It is catching oriented, not stylistic. It is pared to the bare minimum. 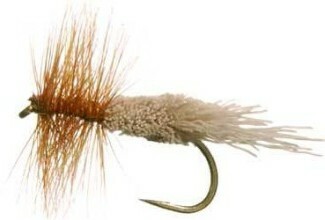 .. Their flies are designed from what they see on the rivers and creeks. They will occasionally cruise the local feather merchant's aisles. Ideas are gathered from all points of the compass and then shared with each other over a brew or two. Experimentation is rampant. "Keepers" become legend and they eventually become standardized, (more or less.) The flies are tied at the kitchen table after the dishes are done. .. There are certain groups of flies that are used for specific times and places. These are loosely codified by river drainage and occasionally time of year. The assemblages are simple. 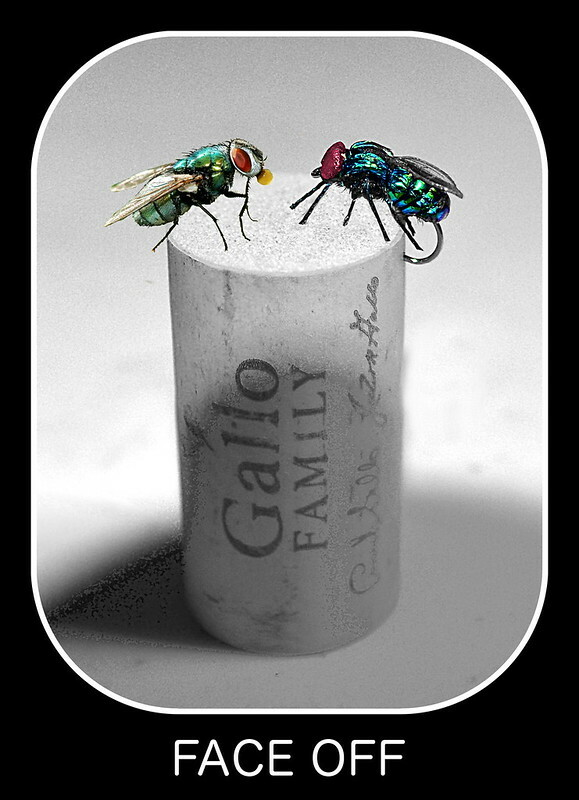 They have no formal designations -- neither do the flies -- usually. 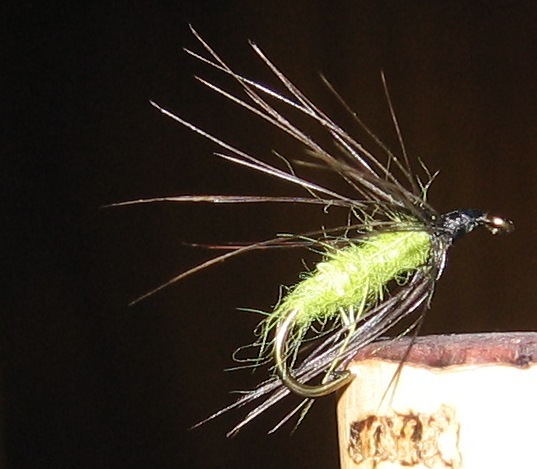 Occasionally descriptive terms are applied to specific flies that have proven themselves. Terms like: The Footed Monster, The Spaghetti Muddler, The Green Floater, etc. 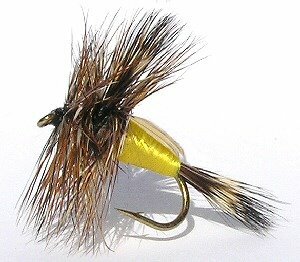 Some are varieties of well known flies. Right now the Red Humpy is in ascendancy. .. The kids currently are expending enormous amounts of energy and gasoline traveling to the hinterland of the northeast corner of the park. Only a few flies are used. They can be made to cover all situations. Sizes are situational. They work: only one has a familiar name. .. 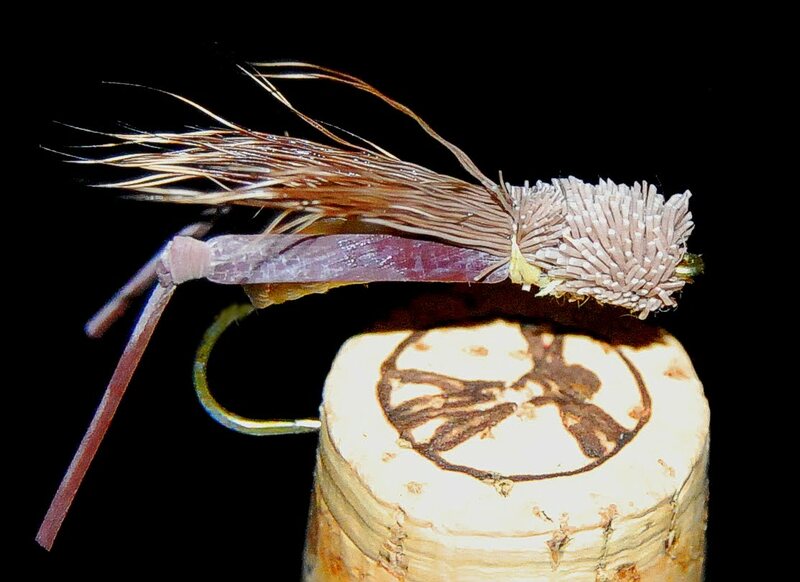 The names are: Dark Floater, Light Floater, Winged PT, Spaghetti Muddler, Red Humpy. The kids have allowed me to make some pictures of the Lamar Five. You should not have any trouble matching the names to the faces. .. This is the time of year when fishers in Yellowstone National Park recite a litany of names familiar to all. Third Meadow, Second Meadow, Soda Butte Creek, Lamar River, Slough Creek, Sulphur Cauldron, Gardner River, Blacktail Deer Creek, etc. .. These are places where the social fishers gather to perpetuate the fiction that these are the best catching locations in the northeast portion of the park. More power to them. .. These are places where it's easy for the casual angler to gather in a bucket load of fish and enjoy the company of other fishers with a popular vocabulary and compatible ring tones. .. These are the places that seasonal shop rats can send visiting fishers and feel safe about their recommendations - even if they've never been there. .. Given that the typical destination fisher has only a few partial days to spend fishing in the park they need to maximize their catching opportunities: usually within sight of the car. Run and gun is the name of the game: just like every other casual visitor. .. On the other hand, shanks mare will bring a few fine opportunities to the angler who is not enamored of social fishing. .. Quietly whisper a few other, less mentioned, names to any park habitue and you may get a quick, sly smile and some really interesting insights. .. What names, you say? 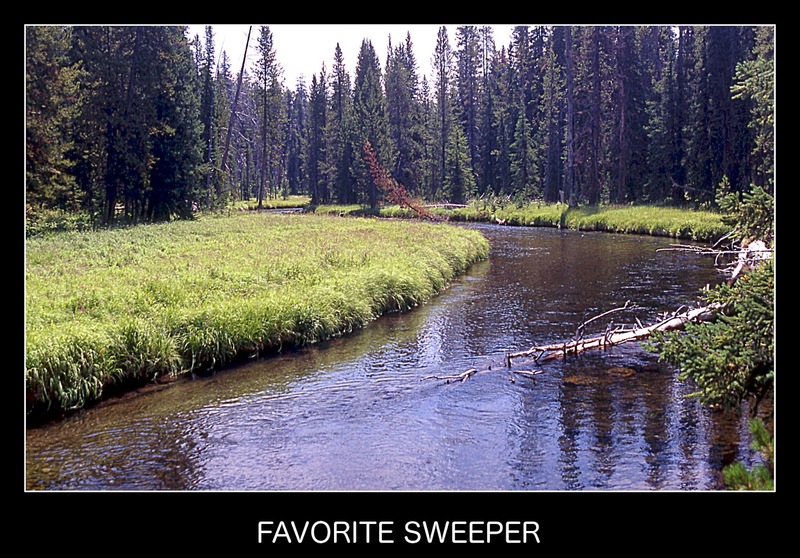 Try Upper Lamar River, Miller Creek, Cache Creek, or Calfee Creek. 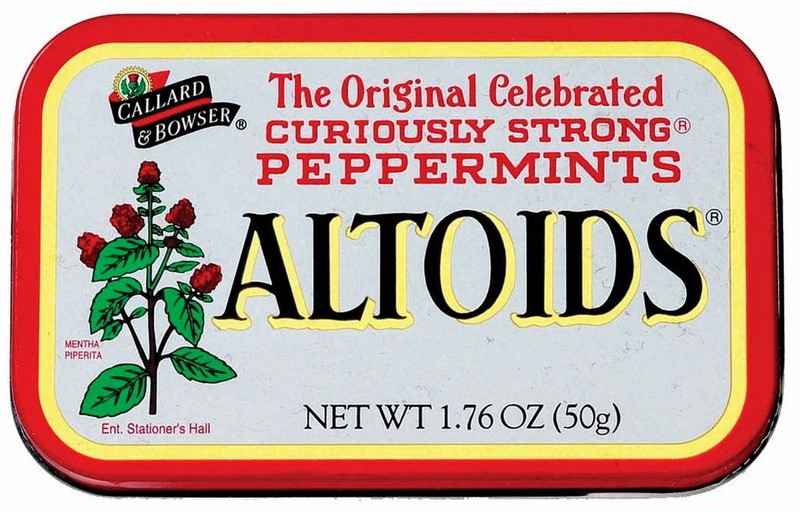 Ask about these at your favorite feather merchant's counter. Ask about the trails. 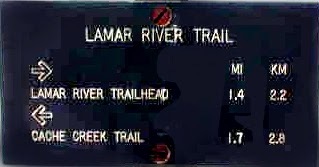 Ask about each discharge eddy into the Lamar River. .. Ask about the first or second distributary gravel bars in the creeks, and the deep dark holes that can be reached with a simple easy cast. Ask about the flies to use and the times to go. Verify the answers with a simple test: when were you last there? .. Should you be inclined to fish the finest catching localities in this section of the park be prepared to walk a long way. It's better to ride a horse. It's even better to spend more than a day - perhaps a week. .. But, then again, sad but true, you'll not be able to share stories with the typical casual park fisher. Your stories will be better and far from public knowledge. .. Keep this in mind if you'd rather be a social fisher. .. 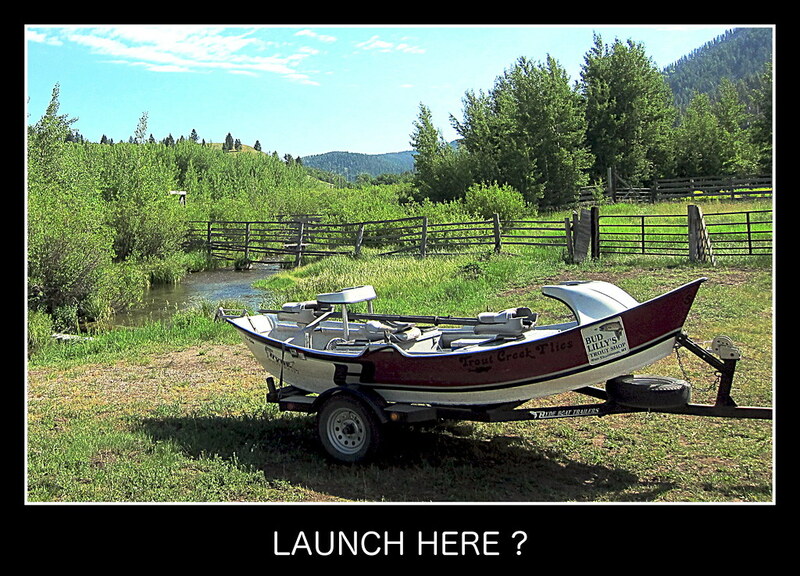 The greatest variety of fishing topography in Yellowstone National Park is now ready to go. Opportunities abound. .. Check in with the feather merchants up that way for complete up-2-da-minute reports. 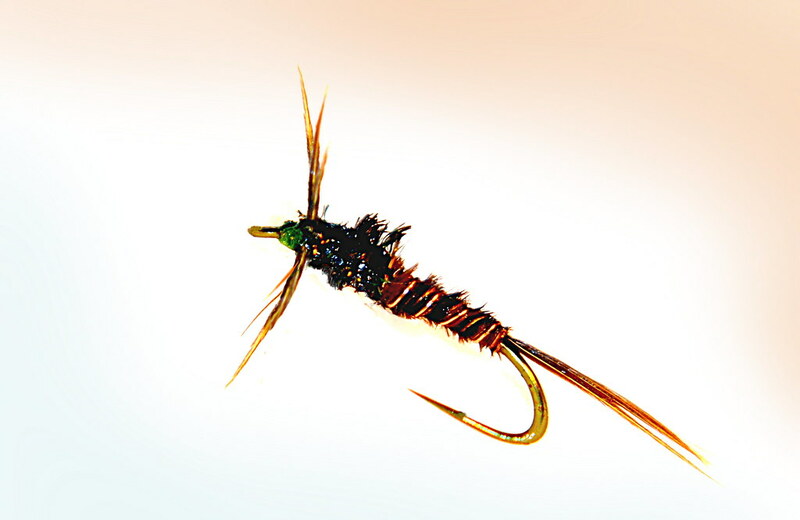 .. For most of these waters the evening is providing spectacular catching on caddis imitations. The hatches have clouded the water and the shoreline grasses. 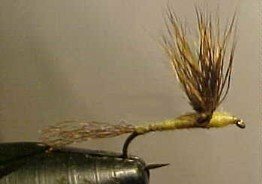 Ovapositing caddis can hide the water from view as little clouds of the critters dance along the water. The trout seem to understand this. Go figure. .. In the mornings there is a choice for fishers: chucking streamers for the submarines, or floating trico fluffies for the majority of the residents. .. 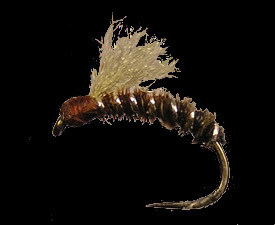 Pick your favorite baetid imitation and fish the BWO hatch, or for that matter any of the hatches where the mayflies are popping. Right now the fish are doing their best to fill their dance cards. .. The cutthroat action has been very good on the Yellowstone River. The water is still very high and dangerous. It is running at about 1,000 cfs above seasonal norms - but it's nicely clear and catching, (like last year,) seems to have improved over the desertic conditions of the previous 5 or 6 years. .. 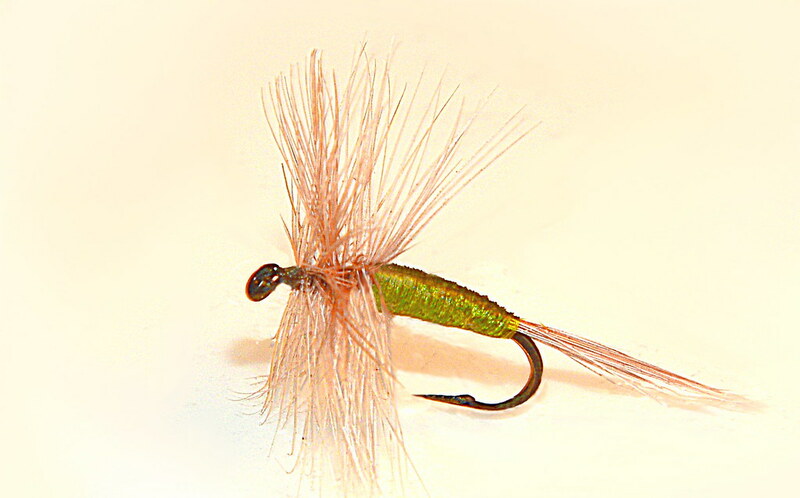 Right now is the perfect opportunity for big fish on big streamers or ugly rubber legs - if you can resist the noses. .. Hatches, even in the high water are pretty strong. There really is no need, (for the moment,) to get in the water. Cruise the banks in your best stealth fashion and use your pocket binoculars to find the noses. As the water drops the fish will seek holding water on the subsurface gravel bars. For now they are finding plenty of cover and food along the bank. Have at it. .. Should you have the legs for it, a stroll down the hill at Tower Falls will provide exceptional catching opportunities both in Tower Creek and the Yellowstone River. This is an excellent place for the late evening fisher to sail a streamer into the haunts of giant fish. Do not go down the hill with a 4 weight and 6x tippet. 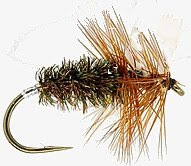 .. As the thunderstorms in the Lamar Valley subside and the shimmering heat of full Summer spreads out, there will be plenty of biting flies to bother your fishing. Puddled water is pretty widespread right now and the mosquitoes are having great feasts of flesh in the Slough Creek campground and the Pebble Creek campground. Keep this in mind. .. There is still a bear, (or 3,) above the campground at Pebble Creek. We've some second hand reports that the fishing is worth the walk. Be loud and raucous once you hit the trees above the little canyon. Carry the bear spray in your gun hand. .. Soda Butte Creek is still a bit raucous but not too dirty. Right now is a good time to fish the confluence waters of this fine little stream. 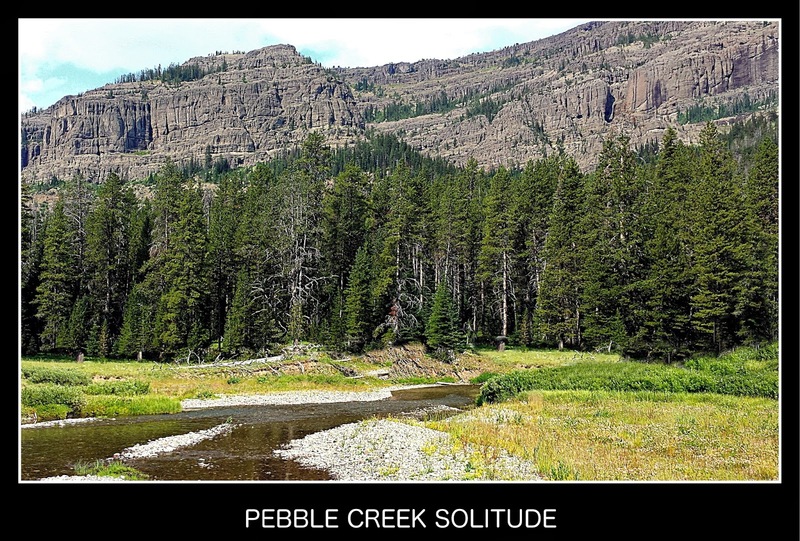 Either the confluence with Amphitheater Creek, Rose Creek, or with Pebble Creek will provide good catching in the current conditions. Fish in the windows and the seams. Hold on tight.